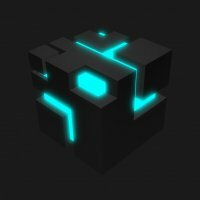 A perspective puzzle platformer about a cube, fallen from the boundless sky, on a poetic adventure through a dark and bottomless hole of life in a cubic metropolis facing numerous hardships to finally step out of the hole into a world of color and light. It features deadly traps based on illusions of the perspective. Each world is populated around cubes which are suburbs of the larger metropolis. UNIQUE MECHANICS: Having a unique perspective manipulation puzzle solving mechanism as a core feature STYLIST: Portraying a whole new cubical world with a minimalist style where a fallen cube fight its way back to color and light. VOYAGE: Through cubical world from pitch black hollow land and heated inferno, to the fallen cities and Cubicopolis. EXTRAVAGANT: Complex structures using simple machinations of the cubic world. The light texture on the player doesn't make a lot of sense. If the player holds a lantern, or something that emits light then the circular light texture would make sense! Interesting concept! Would definitely want to see some improvement in the audio. The music can be a lot better!